Ryan Overturf, B.S. and Len Kravitz, Ph.D. Range of motion is a meaningful component of fitness, especially in older individuals where a deficiency of flexibility can restrict participation in some everyday life activities. A lack of flexibility may also contribute to the likelihood of falls, due to loss of balance and stability (Fatouros et al., 2001). Presently, there is limited scientific evidence that describes the independent and combined effects of strength training and aerobic exercise on flexibility development in older populations. Therefore, the purpose of this study (reviewed) was to examine the effects of 16 weeks of strength training alone, cardiorespiratory training alone, or their combination on the range of motion of various joints of inactive older men. Athanasopoulos, S., Zeeris, I., & Katrabasas, I. (2001). The effects of strength training, cardiovascular training and their combination on flexibility of inactive older adults. International Journal of Sports Medicine. 23, 112-119. Thirty-two sedentary men with an average age of 70 years participated in this 16-week study. Participants were included in the study if their maximal oxygen consumption or VO2max was at or below 25 ml/kg/min. Using ACSM standards, this would place them in the 20th percentile for men 60 years of age and above. All subjects average blood pressure measurement after two readings had to be below 160/90 mmHg. Each of the subjects was screened for any orthopedic and neuromuscular problems by their physician prior to starting the study. Every individual also participated in a graded exercise test using the Bruce protocol, to test for any pulmonary or cardiovascular responses that could pose a risk in their performance for the study. Each subjects peak muscle torque for leg flexion and extension was determined using an isokinetic dynamometer. Leg press and chest press exercises were performed on a Universal machine to determine the subjects one repetition max (1-RM). This same protocol was used to determine the subjects post-training 1-RM. Before each flexibility test, the subjects warmed-up for three minutes on a Monark stationary cycle. Flexibility was measured before and after eight and sixteen weeks of training. Low-back and hamstring flexibility was measured using the modified sit-and-reach test. Range of motion for the following movements was measured using a goniometer: hip flexion, hip extension, hip abduction, hip adduction, shoulder adduction, shoulder flexion, shoulder extension, elbow flexion/extension, and knee flexion/extension. The 32 subjects were randomly assigned to one of the following four groups: control group (C), cardiovascular training group (CT), strength training group (ST), and combination of strength training and cardiovascular training (STCT). Those in the control group did not train throughout the 16 weeks. The other three groups trained three times a week for sixteen weeks. Each of the training protocols had a warm-up period of three to five minutes which consisted of walking or cycling at 40% of their heart rate maximum. The training sessions were between 45 and 50 minutes and were supervised at all times. CT Protocol. The protocol for the CT group consisted of walking or jogging on a treadmill with a starting grade of 0o. Throughout the 16 weeks, the protocols intensity and duration were gradually increased. Intensity was set at 50% in weeks 1 and 2, and increased 5% per week until the eleventh week where it was set at 80% and that intensity level was maintained for the rest of the study. Heart rate was measured throughout each session for all clients. ST Protocol. Those in the ST group performed eight exercises on a Universal machine in the following order: chest press, leg extension, shoulder press, leg curls, latissimus pull down, leg press, arms curls, and triceps extension. Each subjects 1-RM was measured before the study and once per week during the study for all exercises. Two sets of 8-12 repetitions were performed at an intensity of 55-60% 1-RM in the first four weeks. In the weeks thereafter, the sets were increased to three for each exercise. In weeks five through eight subjects did 10-12 reps at an intensity of 60-70% 1-RM. Weeks nine through 12 consisted of 8-10 reps at 70-80% 1-RM. In the final four weeks the intensity was at 80% 1-RM, and the subjects performed 8 reps in all three sets. STCT Protocol. In the STCT group, each subject performed the same strength and cardiovascular program described above. The strength training program was done first and after 60 minutes of rest the subjects performed the cardiovascular program. The present study demonstrates that resistance exercises alone, and when combined with cardiovascular training, independently improve flexibility in inactive older males. 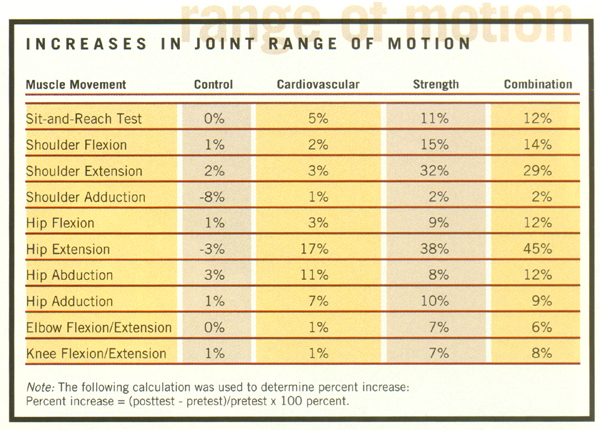 The results (presented in Table 1) clearly show an increase in flexibility in the majority of the joint ranges tested. It is also observed that cardiovascular training had a minimal effect upon joint flexibility, except hip flexion and hip adduction. These results could possibly reflect a movement specific adaptation from the strength training exercises. It was interesting to see that shoulder adduction showed virtually no change in range of motion. This was most likely due to the fact that there were no exercises performed for this specific movement. The flexibility of a joint is maintained or improved when that joint is regularly taken through its range of motion. Thus, participating in physical activities that ensure a clients optimal joint range of motion appear to ensure flexibility of that joint. Previous investigations (see Table 2) on this topic have had mixed results regarding the benefits achieved in flexibility with strength and/or cardiovascular training. From this novel and very applied study, it appears that in inactive older males, strength training can substantially increase flexibility in multiple joint motions, independent of flexibility exercises. Although research in this area is needed with older females, due to similar tissue and joint structures, analogous results would surely be hypothesized. The authors of this study theorize that resistance exercise improves the tensile strength of the tendons and ligaments, as well as increases the contractility of the muscles, which, in time, increases a joints range of motion. This finding is not meant to negate the importance of flexibility exercises, nor suggest their omission from an individuals exercise program. However, this investigation does show an added benefit of strength training for older clients, besides the known improvements in muscular strength and endurance, body composition, glucose metabolism, coronary risk factors, bone mineral density, and psychological well being. As personal trainers and fitness professionals, it is enlightening to empower our elderly clients that properly designed and supervised resistance training programs can also improve their musculoskeletal health and range of motion.